Natural history: Gymnodoris sp. #7 is a moderately common species found in protected to exposed rocky habitats from < 1 to 6 m (< 3 to 20 ft). Rarely, it can be found in Halimeda kanaloana beds to 12 m (39 ft). Kay (1979) states that it feeds on aeolids of the genera Favorinus and Aeolidiella. It lays a pale orange, spiral egg mass that hatches in about 7 days in the laboratory. Distribution: Big Island, Maui, Oahu, Kauai(?) and Midway: also found in French Polynesia. Taxonomic notes: It was probably first reported from Hawaii in Kay & Young, 1969 (as Gymnodoris alba). It is listed in Kay, 1979 as G. alba. There remains some chance that more than one species are lumped under this number. Photo: CP: 6 mm: Kapalua Bay, Maui; April 3, 2007. Note 1: The two animals illustrated as "after feeding" (see photos) have more strongly inflated bodies with better defined internal masses than other animals. It seems likely that they have just fed recently (the second animal regurgitated a large amount of brownish material three days after capture and appeared more normal after doing so). 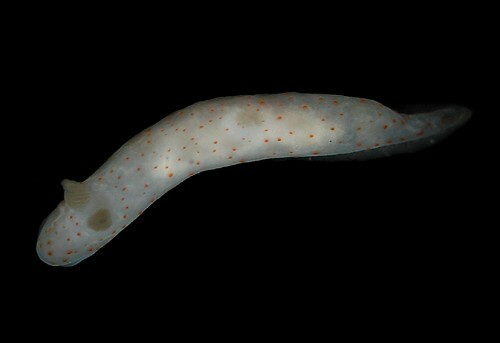 However, their somewhat atypical appearance might also be due to a disease or parasite. It's also possible that they are carrying eggs.